The hip joint is the largest weight-bearing joint in the human body. It is also referred to as a ball and socket joint and is surrounded by muscles, ligaments, and tendons. 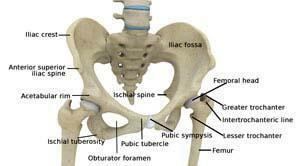 The thighbone or femur and the pelvis join to form the hip joint. Any injury or disease of the hip will adversely affect the joint's range of motion and ability to bear weight. The hip joint is the junction where the hip joins the leg to the trunk of the body. It is comprised of two bones: the thighbone or femur and the pelvis which is made up of three bones called ilium, ischium, and pubis. The ball of the hip joint is made by the femoral head while the socket is formed by the acetabulum. The acetabulum is a deep, circular socket formed on the outer edge of the pelvis by the union of three bones: ilium, ischium and pubis. The lower part of the ilium is attached by the pubis, while the ischium is considerably behind the pubis. The stability of the hip is provided by the joint capsule or acetabulum and the muscles and ligaments which surround and support the hip joint. The head of the femur rotates and glides within the acetabulum. A fibrocartilaginous lining called the labrum is attached to the acetabulum and further increases the depth of the socket. The femur or thighbone is one of the longest bones in the human body. The upper part of the thighbone consists of the femoral head, femoral neck, and greater and lesser trochanters. The head of the femur joins the pelvis (acetabulum) to form the hip joint. Next to the femoral neck , there are two protrusions known as greater and lesser trochanters , which serve as sites of muscle attachment. Articular cartilage is the thin, tough, flexible, and slippery surface lubricated by synovial fluid that covers the weight-bearing bones of the body. It enables smooth movements of the bones and reduces friction. Iliof emoral ligament: This is a Y-shaped ligament that connects the pelvis to the femoral head at the front of the joint. It helps in limiting over-extension of the hip. Pubof emoral ligament: This is a triangular shaped ligament that extends between the upper portion of the pubis and the iliof emoral ligament. It attaches the pubis to the femoral head. Ischiof emoral ligament: This is a group of strong fibers that arise from the ischium behind the acetabulum and merge with the fibers of the joint capsule. Ligamentum teres: This is a small ligament that extends from the tip of the femoral head to the acetabulum. Although it has no role in hip movement, it does have a small artery within that supplies blood to a part of the femoral head. Acetabular labrum: The labrum is a fibrous cartilage ring which lines the acetabular socket. It deepens the cavity increasing the stability and strength of the hip joint. Gluteals: These are the muscles that form the buttocks. There are three muscles (gluteus minimus, gluteus maximus, and gluteus medius) that attach to the back of the pelvis and insert into the greater trochanter of the femur. Adductors: These muscles are in the thigh which help in adduction, the action of pulling the leg back towards the midline. Iliopsoas: This muscle is in front of the hip joint and provides flexion. It is a deep muscle that originates from the lower back and pelvis, and extends up to the inside surface of the upper part of the femur. Rectus femoris: This is the largest band of muscles located in front of the thigh. They also are hip flexors. Hamstring muscles: These begin at the bottom of the pelvis and run down the back of the thigh. Because they cross the back of the hip joint, they help in extension of the hip by pulling it backwards. Nerves of the hip transfer signals from the brain to the muscles to aid in hip movement. They also carry the sensory signals such as touch, pain, and temperature back to the brain. The main nerves in the hip region include the femoral nerve in the front of the femur and the sciatic nerve at the back. The hip is also supplied by a smaller nerve known as the obturator nerve. In addition to these nerves, there are blood vessels that supply blood to the lower limbs. The femoral artery, one of the largest arteries in the body, arises deep in the pelvis and can be felt in front of the upper thigh. All the anatomical parts of the hip work together to enable various movements. Hip movements include flexion, extension, abduction, adduction, circumduction, and hip rotation.